Haenah Kwon ’17 makes comfort her number one priority. She’s excited for the spring to come so she can wear something more garish than the long black coat that she has worn throughout the winter season. 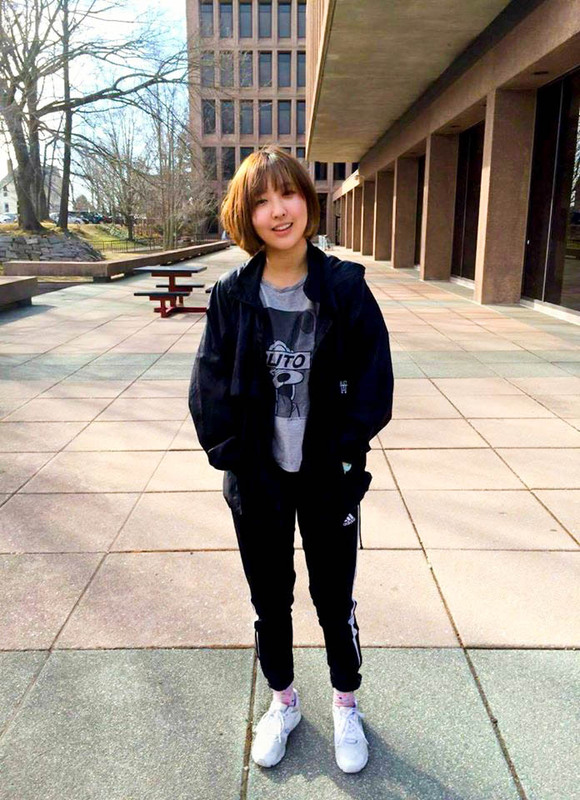 Kwon sat down with The Argus to talk about clothes with a sense of humor, her Korean influences, and wearing jeans for the first time. Haenah Kwon: Comfortable but funny. A sense of humor is what I really like about what I wear. I like looking at a lot of Facebook pages that have different styles but are really funny and brighten my day. A: Where are you from and how has it influenced your fashion? HK: I am from Korea and Seattle. I was born in Korea and I was there until fourth grade. I also went back every summer and I lived in a Korean community in Seattle. I buy a lot of my clothes from streets and pop-up stores in Korea. It guess it looks unique to people at Wesleyan. A: How has your style changed, if at all, since you came to Wesleyan? HK: Compared to when I was first here, my style has become more monotonous. It has become more black-and-white. As a freshman, I was excited and wanted to show off and wear more colors. There was a lot of stuff going on. A: So is comfort your number one priority? HK: I think so. I can’t wear a lot of different fabrics because I am sensitive, so I can’t wear things like knit [garments]. A: Where are your favorite places to get your clothes in the States? HK: Online shopping, especially since I am at Wesleyan now. Uniqlo is a good place to go. I also like looking at the brand Lazy Oaf, and it has the sense of humor I like. A: What do you mean by sense of humor? HK: A bit pop-y, in a sense. Googly eyes, words, and a bold style. A: What’s your process of getting dressed in the morning? HK: I definitely don’t think about it a lot. I wake up and see what the weather is. Temperature is really important, and I don’t try to dress cool to be fashionable. I definitely dress warm if it’s cold out. A: What’s your favorite article of clothing? HK: Caps. Not snapbacks. Baseball caps. A: And what’s your favorite season to dress for? HK: My favorite season to dress for is spring or fall. In the winter, I wear the same thing. I wear this black coat that covers both my face and my legs. I basically live in it. In the summer, I don’t have to wear much, so fall and spring is when I can wear the perfect amount of layers. A: What is something you would not wear? HK: I would not wear heels. I always wear tennis shoes, even with dresses, because I care about comfort. A: Is it a faux pas to wear things twice in a short span of time? HK: I think it is a very efficient way of living. Very rarely, but sometimes, I sleep in the outfit I wore. A: What is the craziest thing you’ve ever worn? HK: I’m not bold enough to do this again but I have worn pajamas to class. It was a seminar class so my professor was right next to me. I don’t know how I did it. I guess I was not thinking about it at all and wore my pink pajamas. A: What do you like most about style at Wesleyan? HK: Wesleyan is a good place to explore fashion that I would not be able to wear. In Korea, a lot of people judge you for what you wear and how exposed you are. Outside of Wesleyan, people care less about fashion adventures, so I think Wesleyan is a good place to explore different styles. A: What is one style you wish to try or are trying? HK: I have been trying to wear jeans. I’ve never worn jeans, so I was wondering why people wear these uncomfortable things. I started to wear it and I think it can look cool. We will see if I can stick to it.